Documents can be in different format and you would need specific program application to open / edit respective document file format. Zoho viewer provide one stop online solution to deal with any type of Office document file. You can convert document files from one format to other desired format online without any sign-up or login. Besides the quick conversion, you can open and preview documents online in Zoho viewer. 1. 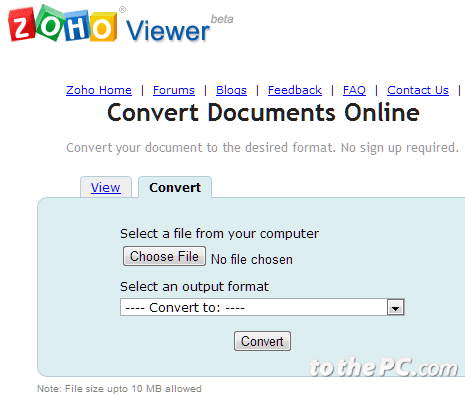 Open http://viewer.zoho.com/converter for using online conversion application. 2. Click ‘Choose file’ button to select file that you want to convert (upto 10MB size). 3. Then select desired destination file format from drop down box. 4. Click convert button to get file in required format. Once document file is converted into desired format, you can view it using software program installed on your computer. You can also view document file without any software program using Zoho Viewer online. 1. 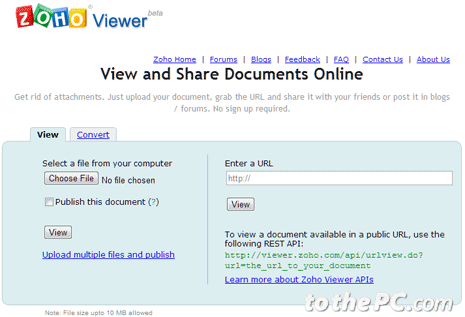 Open http://viewer.zoho.com/home.do document viewing application. 2. Click Choose file button to select and upload documents from your computer. Alternatively, you can enter URL of online document file. 3. Then click View button to preview selected document file online. Zoho Viewer application supports majority of document file formats for conversion and online viewing. 1. Microsoft Office: doc, docx, xls, xlsx, ppt, pptx, pps. 2. OpenDocument: odt, ods, odp. 3. OpenOffice: sxw, sxc, sxi. 4. Other Formats: wpd, pdf, rtf, txt, html, csv, tsv. Zoho Viewer for sure provide quick and easy way to convert and view documents online. Similarly, you can also use Google docs (docs.google.com) to create, edit, convert and view document files online.